Description of Project: Their work is cutting-edge, their digital tools hopelessly outdated. Scientists in biochemical laboratories take on all kinds of challenges from creating more efficient batteries to healing cancer. To ensure reproducible scientific results and keeping track of all experiments, proper documentation is absolutely crucial. However, many scientists still use pen and paper to document their work. In a so-called “lab journal” they record all information that is needed to reproduce an experiment. This cumbersome manual task requires a lot of time and effort that could be better spent on a more important task.In collaboration with the German Fraunhofer Institute for Manufacturing Engineering and Automation (IPA), we set out to find a solution to this problem as part of our Bachelor’s thesis. The “Multitouch Lab Journal” (MLJ) is the result of our work. It is a computer-system based on a large multi-touch screen. The system is protected by a solid glass surface and integrated into a regular workbench. While the hardware of the MLJ is already cutting-edge, the user interface is really what sets it apart from other systems. One of the unique innovations is the new way of graphically managing experiments. All experiments are displayed as nodes within a tree-like diagram and can be organized into branches. A Zoomable User Interface enables intuitive control, similar to the navigation on a digital map. Another innovation is the actual documentation of experiments. No longer are experiments recorded in a journal but in a Chinese fan-like document, which can be easily manipulated through gestures. In addition to a digital pen, the application uses intelligent recognition algorithms to detect users input and support them, e.g. with handwriting recognition. Furthermore the MLJ is able to optically identifying objects on the table’s surface and display metadata, e.g. the properties of a reagent. The system also contains a database with standardized templates for often-used methods and experiments. Through the interconnectedness with other laboratory devices, the MLJ can even execute parts of the documentation process by itself. Since most scientists work within a team, certain functionalities known from social networks enhance communication with coworkers and aid to keep track of the team’s activities. The system also allows for reserving laboratory devices, scheduling meetings and ordering new supplies. So far the MLJ is mostly a concept, existing only on paper. However, engineers at Fraunhofer IPA have started working on implementing a prototype of the system. 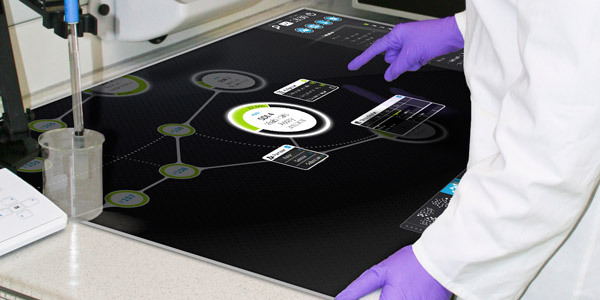 In the future, the Multitouch Lab Journal could revolutionize the work in biochemical laboratories and allow scientists to spend less time at the desk and more in the lab – improving batteries and healing cancer.